About 90 people participated in the annual Christmas dinner of the Network of Entrepreneurs of Marbella, REM which was held at the facilities of the Gran Meliá Don Pepe hotel this Saturday 2nd of December of 2017. During this night the awards were given recognizing the most outstanding members of the REM association and this time the special prize of the night was given to Ángeles Martín Prats, professor of avionics at the ETSI of the University of Seville and founding partner of Skyline Engineering. 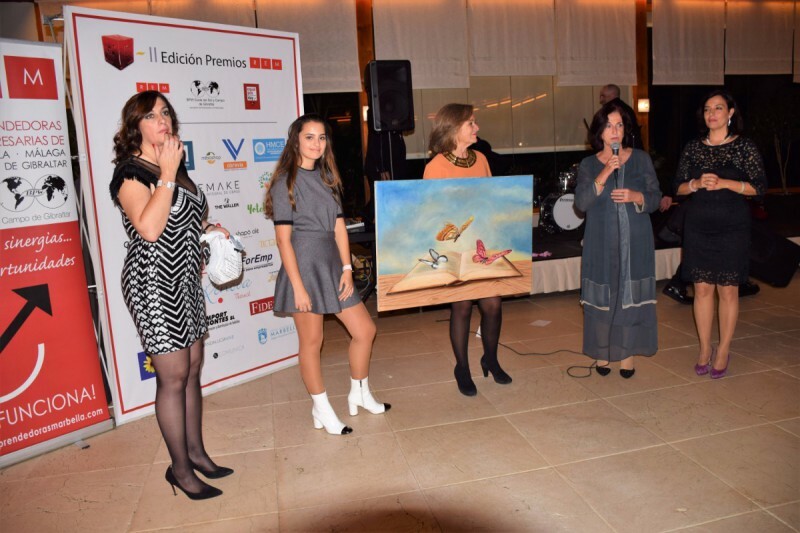 Among those who attended the Christmas Dinner and awards were representatives of the City Council and other business associations in the area such as the president of CIT Marbella and associations of small and medium-sized businesses in San Pedro, Marbella, Apymespa and Apymen. Myriam Herrera, the president of REM, highlighted the importance of business cooperation to expand the network of contacts and advance in a highly competitive market. REM was born with the aim of creating a network in which all the members contribute to all the members and thus be able to generate business among them but also with other companies under the premise that in the union is the strength. Ana María Ros for the “Workshop of the year”, an award recognizing the workshop given by her in the area of social networks and digital marketing. José Ramírez, from “Talleres Empremar” a vehicle body-fix and Paint Company for its growth along the year. Luisa Martínez, director of private banking, in the “Young Entrepreneur” category. And Maribel Muñoz from “Yo te limpio” who was recognized as “Best Networker”. In this way, the members of REM received the recognition and the imposition by their currently more than 120 and growing partners, making this organization a promise that gains every time more strength in the business sector of Costa del Sol during a night they celebrate with their eyes on the future. REM is born thanks to the initiative of several enterprising women in the area, who decided to join forces and use the synergies that emerged between them. With a clear vocation to promote Networking, REM forms a network of support and promotion for associated companies. This network works with the values of, professionalism, commitment, positive attitude, responsibility, ability to transfer information, gratitude, and a pro-active attitude which are a must for every member. Among their business activities, they held a monthly work meeting, in which each member has the opportunity to present their company, expanding their network of contacts, and pass references and business opportunities to others creating a trustful and safe business environment.